I know this book has been touted on other blogs as recommended reading and I know I'm a little late in joining in, but I want to add my voice to everyone else in asking you to read it. Back to the book. I have hardly put it down since checking it out because so much of what the author writes is resonating with me. The appearance of the book in my life at this point is of perfect timing. The author writes of her travels over a year to three different countries as she searches for inner answers to her life. Elizabeth writes in a voice that is insightful, entertaining and very poignant. I am also at a point in my life where I'm questioning my life. Moving away from my friends and the city where I lived 17 of my 18 years of marriage, has moved the earth beneath my feet. My familiar surroundings have been stripped away. It is exciting and scary all at the same time. 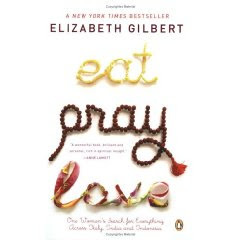 Which has me relating to the words in Eat, Pray, Love and the author's spiritual journey. I am finding inspiration and comfort in this book. Maybe you will too. Excuse me now, I have to get back to reading it. Katherine, I LOVE LOVE LOVE LOVE LOVE LOVE LOVE LOVE LOVE LOVE LOVE LOVE LOVE LOVE LOVE LOVE LOVE this book!!!!! I also found so much familiar and so much comfort in it. Sending you a long distance hug my friend!